Artistic illustration of density map of the enzyme beta-galactosidase determined by cryo-electron microscopy at 2.2 angstrom resolution. An essential enzyme in the human body, beta-galactosidase is commonly used in molecular biology as a marker to monitor the expression of genes. 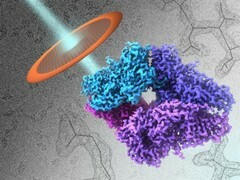 The foreground shows the overall shape of the molecule (right) and an electron beam striking a specimen grid (left), while the background shows images of single molecules (upper left) and the atomic contours of amino acids in the structure (lower right).